Expert opinion by Chris Bone, Vice President Access Control Solutions EMEA, ASSA ABLOY. EXPERT OPINION. Let’s begin with something that’s hardly front-page news: the market potential for wireless access control is huge. 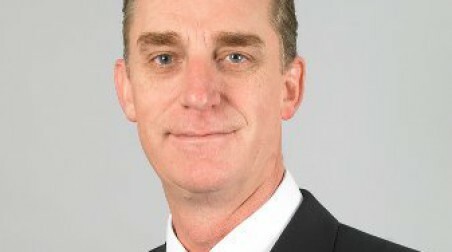 At January’s Intersec exhibition forecasts of 15% annual growth in the Middle East region alone were suggested. 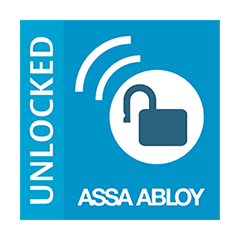 ASSA ABLOY’s own data predicts that wireless locks could make up 30% of the total market within a decade. The potential is there. 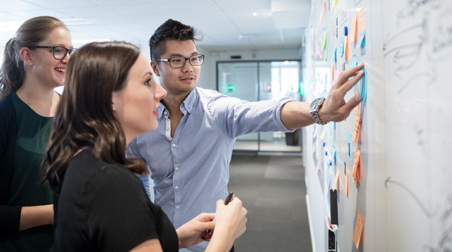 But when ASSA ABLOY worked with IFSECglobal.com last year on a major market survey of security managers, industry insiders and decision-makers, we encountered some big surprises. 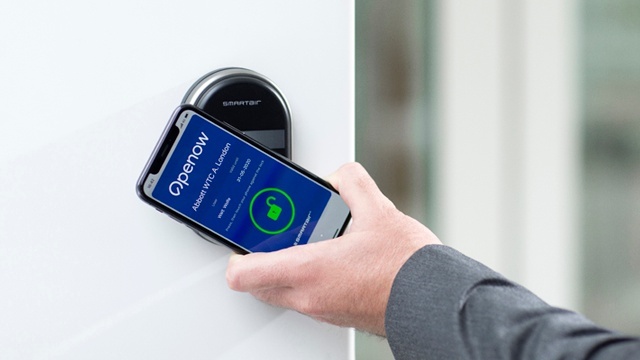 The conclusion: our market knows less than you think about wireless locks. 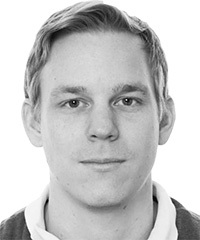 The market for wireless access control remains embryonic. 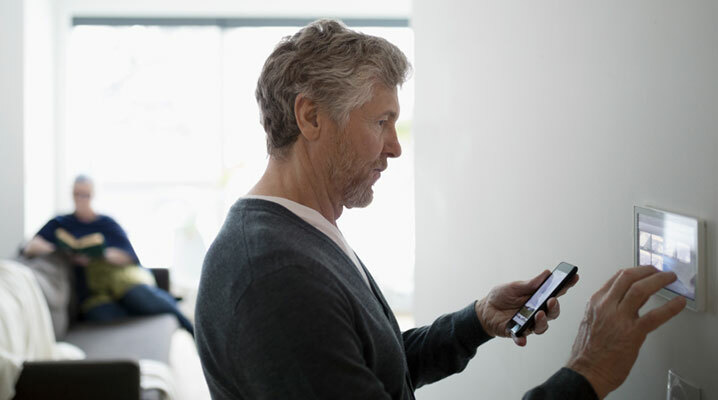 Just 6% of businesses have a fully wireless system. In addition, 17% of premises employ a hybrid solution, a mixture of wired and wireless access systems. This low installed base obviously represents an opportunity for manufacturers of wireless access control systems. 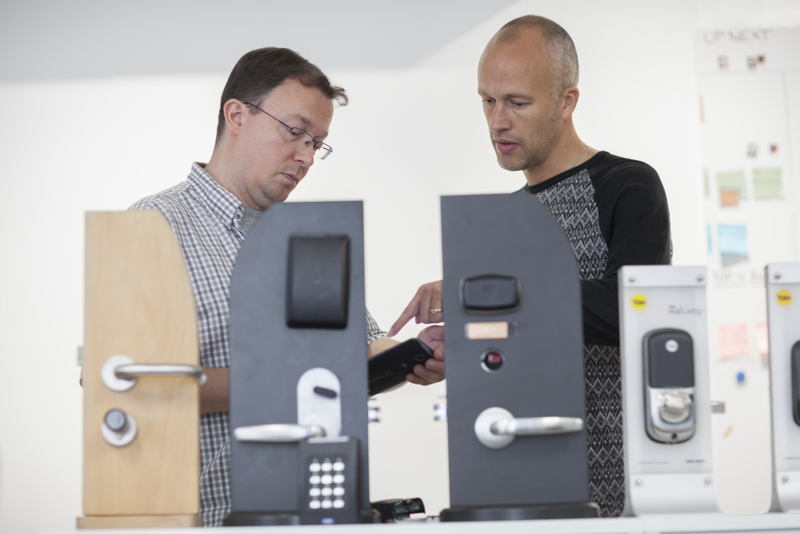 But access control is a fiercely competitive market, with systems from 19 different manufacturers used by survey respondents, including TDSi, ASSA ABLOY and Paxton etc. A mechanical master key system is expensive to run, because of its inflexibility in changing access rights and secure key management costs. Losing a master key means replacing mechanical cylinders and keys right across your facility. There’s no shortcut. 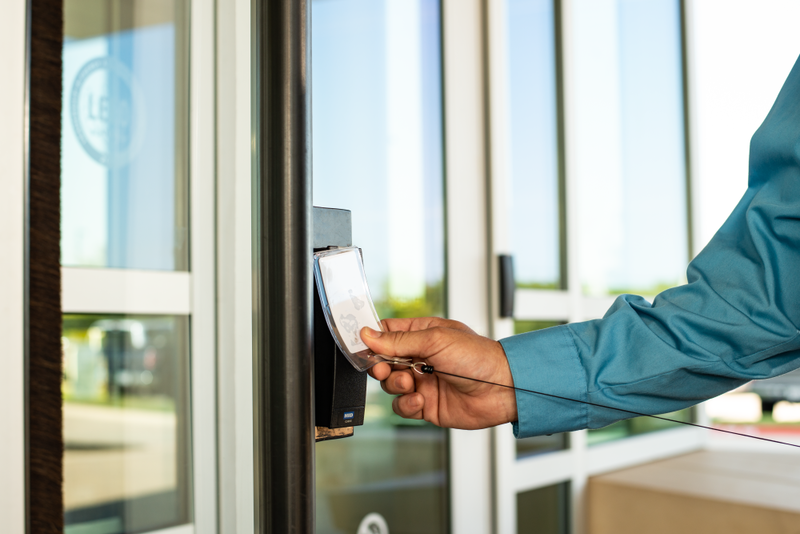 With an access control system, it takes a few seconds to issue or revoke cards, from a computer or a smartphone. 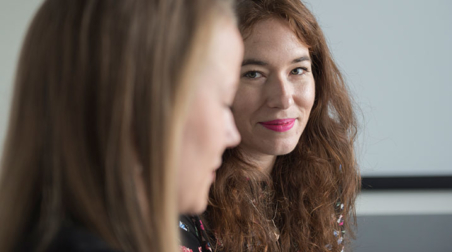 You can monitor and manage your premises, at any time of day or night. Reprogramme an RFID card and you have a new key—instantly. 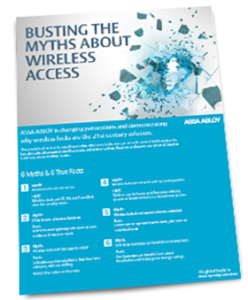 There are so many myths about what wireless locks can and can’t do. 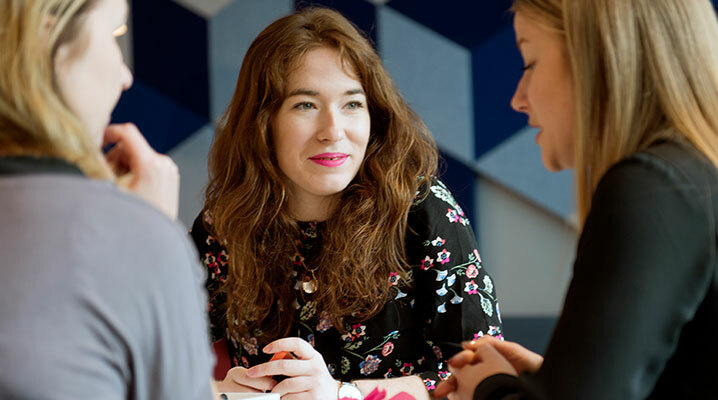 Potential is huge, but the market is suffering from some serious misconceptions. What about the fact that wireless locks are not secure? Only around one in five businesses currently enjoys the benefits of wireless access control. Why? In the trade-off between convenience and security, the latter must always prevail—and another statistic may explain a reluctance to upgrade. 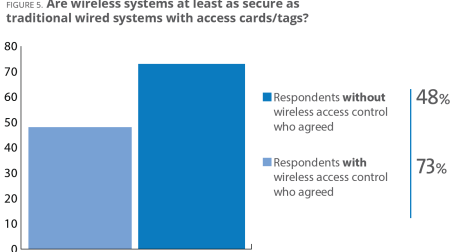 Eighteen percent of those with wired systems, or no electronic system at all, think wireless access control systems are less secure than wired access control. Those who already use wireless systems are surely better placed to judge their qualities. Of those with at least a partly wireless operation, three-quarters agree that wireless systems are at least as secure as traditional systems. However, only 1% “strongly disagree”, hinting that this is a speculative hunch rather than a strong conviction. Those who already use wireless systems are surely better placed to judge their qualities. Of those with at least a partly wireless operation, three-quarters agree that wireless systems are at least as secure as traditional systems. Just 7% dissent and then only “to some extent”. 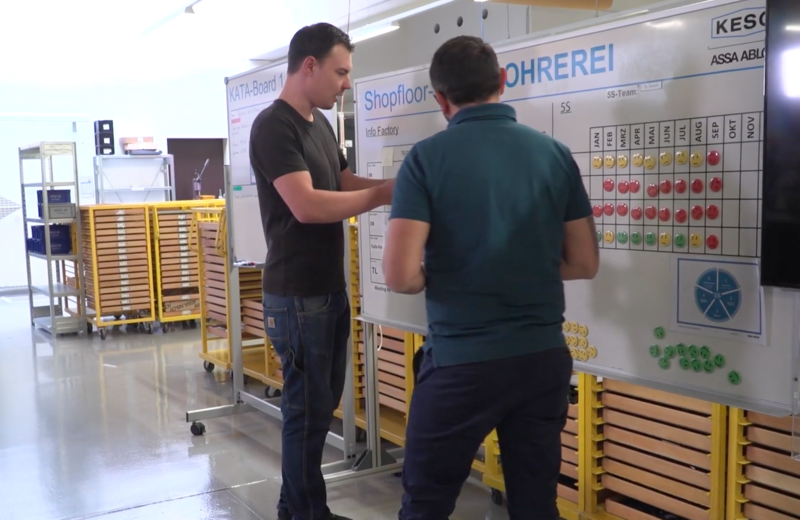 Four respondents in five (79%) believe that the adoption of electronic access control by small businesses, and even households, will soar in the next few years. Further, 68% of those not using wireless products are unaware that they consume far less energy than magnetic locks or strikes. 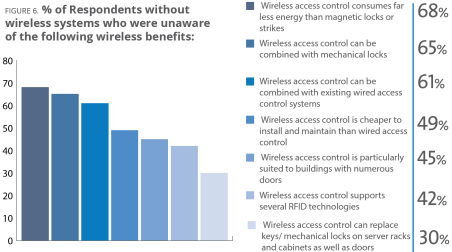 Nearly half of the same group are unaware of the following benefits of wireless access control too: that it is generally cheaper to install and maintain than wired control (49%); that it is suited to buildings with numerous doors (45%); and that it can support multiple RFID technologies (42%). More knowledge gaps. 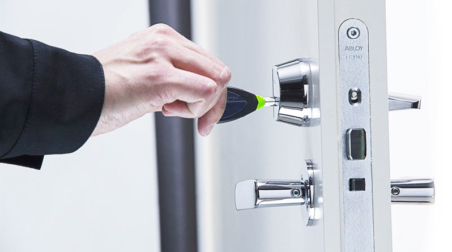 Many of those using exclusively wired systems are also unaware of the versatility of wireless access control, including such applications as replacing mechanical keys on server racks and cabinets (30%) and—the biggest proportion of all—its potential for combined deployment alongside mechanical locks (65%). 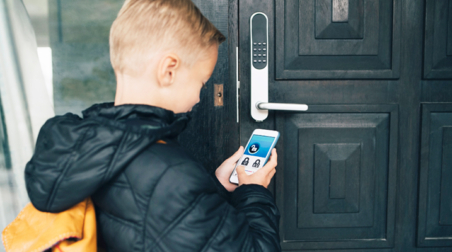 “If you thought wireless locks don’t support multiple credentials, sorry, you’re wrong. 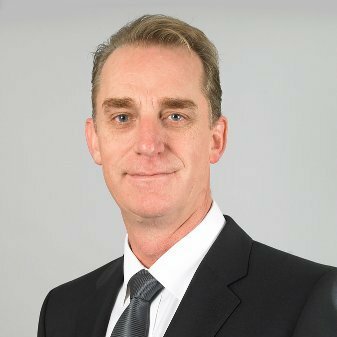 Products that offer multi-authentication via PIN, smart card or mobile phone are out there.”, says Chris Bone. Are wireless solutions more complicated? 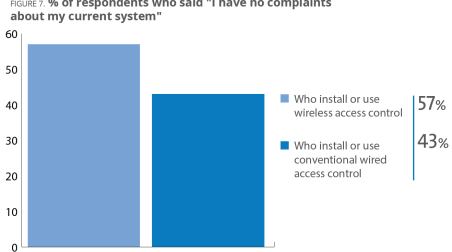 For starters, almost two-thirds of those we surveyed thought that fitting a wireless access control system would be disruptive to an already fitted traditional system. 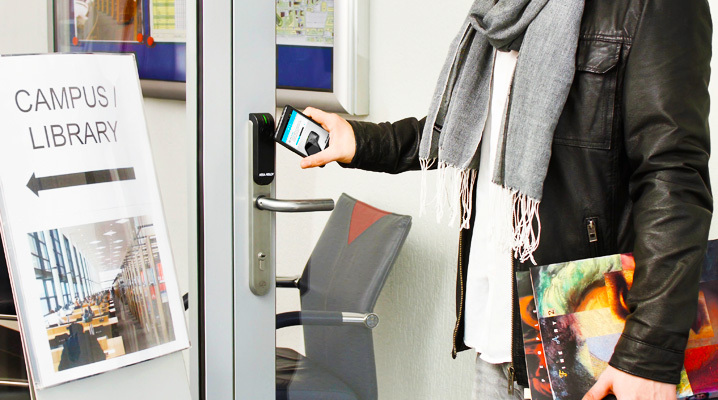 In fact, wireless access control systems can run fully integrated with an existing wired system, even if it incorporates CCTV or energy management functions. 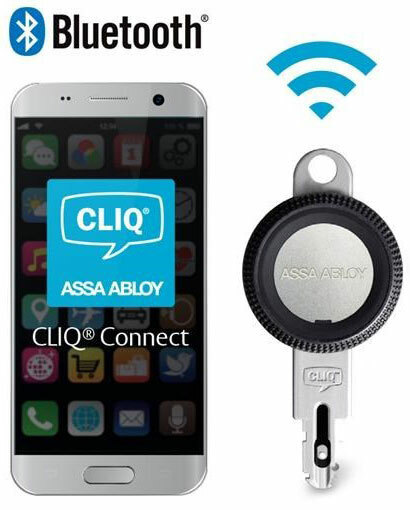 Integrations have been exhibited, by ASSA ABLOY and other leading access control manufacturers. Installation is quick and easy. 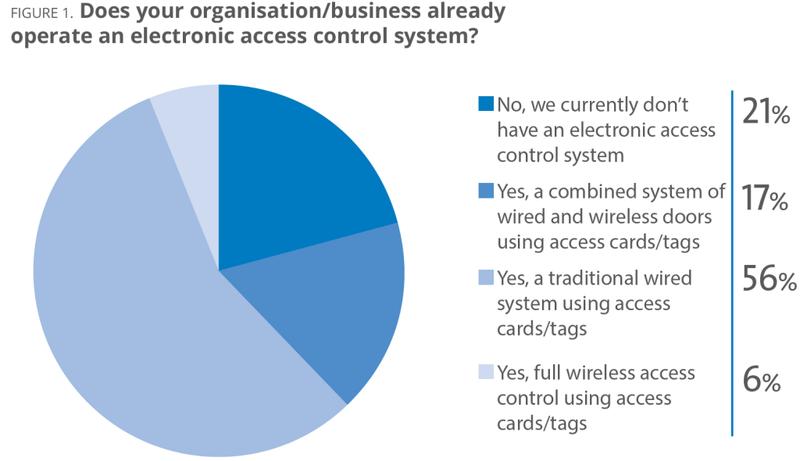 Around a third of our respondents using wired access control had no idea that wireless systems use much less energy. 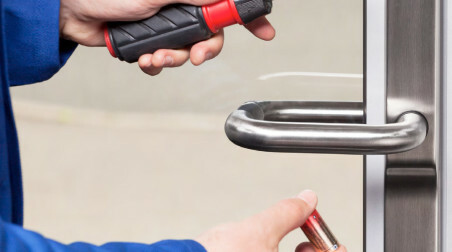 Because wireless locks are battery powered and only “wake up” when a credential is presented, they consume a tiny fraction of the power used by always-on wired mag locks. And battery life? Not a problem—that’s another market myth shared by close to 100% of our research group, who expected wireless lock batteries to drain too quickly. 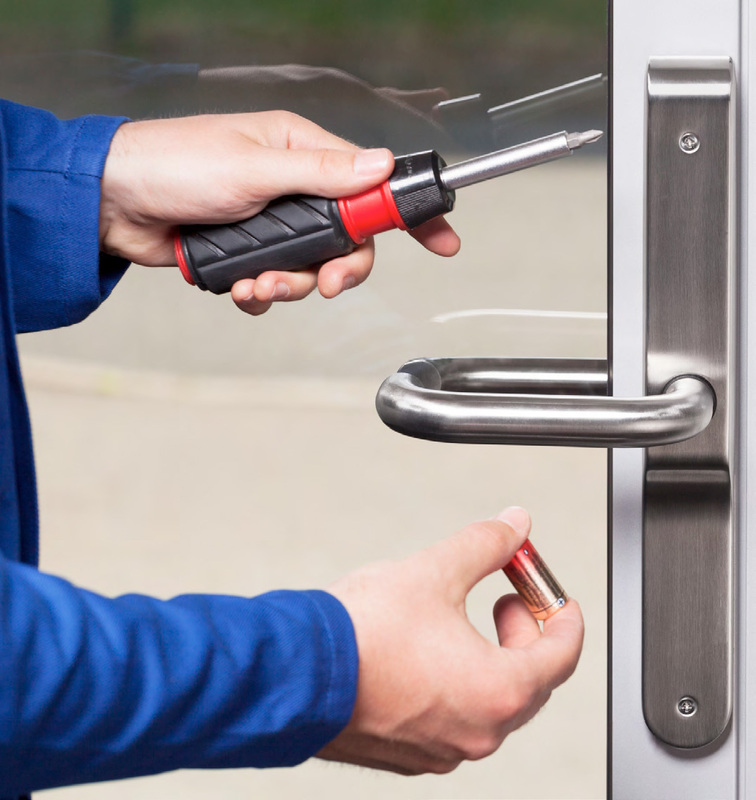 In fact, our own Aperio® or SMARTair™ locks run for approximately 2 years on a new battery. 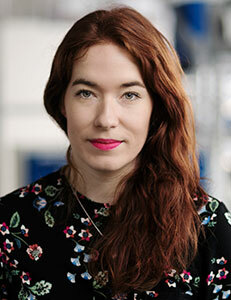 The IFSEC Global survey suggests that facilities managers, installers and integrators are less likely to encounter problems with wireless access control. 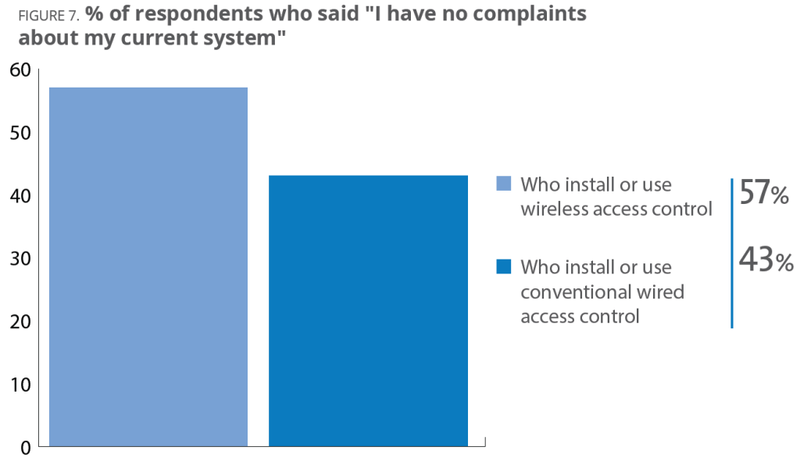 Fifty-seven percent of those who use or install wireless access control say they have no problems with their current system, against 43% who use traditional wired systems. The biggest gripes are that wireless systems are complicated and expensive to install (21%) and expensive to maintain (14%). 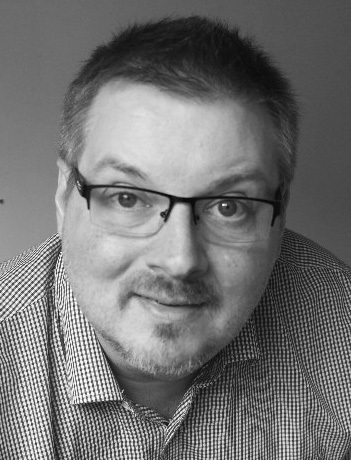 Stay tuned to the Future Lab for more insights in wireless technology from Chris Bone soon. 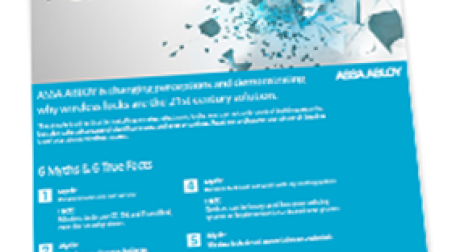 Download the ASSA ABLOY Fact Sheet to discover the true benefits of wireless access control.